Famous wives of US politicians have mostly been wives of Presidents, but the new breeds of wives are quickly changing that narrative. In fact, this time, wives of governors, senators, and even Treasury Secretaries are beginning to take center stage. One of those women gaining traction is Trump’s millionaire treasury secretary Steven Mnuchin‘s wife, Louise Linton; who has made headlines more than a few times now. 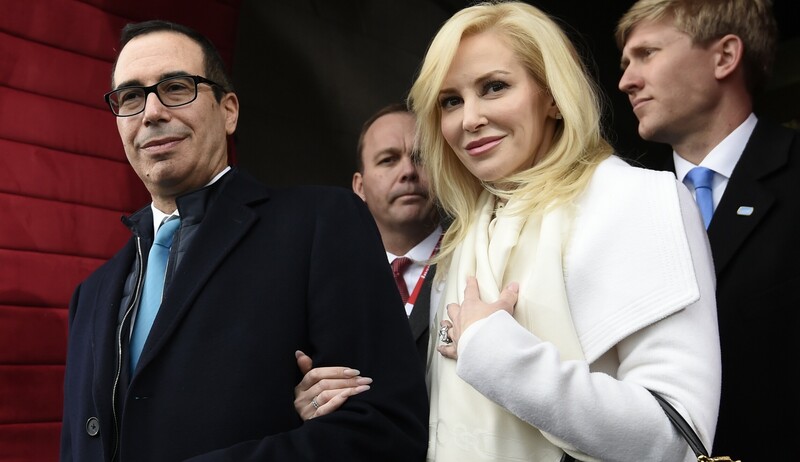 In mid-November of 2017, Linton was caught up in a crossfire when she and her husband posed for a photograph; holding up sheets of US dollar bills. The picture was taken at the Bureau of Engraving and Printing to celebrate the first currency notes bearing Mnuchin’s signature. The couple had met each other through mutual friends and were married in June of that year. The high-profile ceremony was held just a few blocks from the White House. It was officiated by US Vice President Mike Pence, with several members of the Trump administration in attendance. But Louise Linton is more than just a Scottish bride. She is also an actress and until 2017, was divorced from her first marriage to the criminal defense attorney, Ronald Richards. Here is more about Steve Mnuchin’s wife. Louise Linton (a.k.a Louise Hay) was born on December 21, 1980, in Murrayfield area of Edinburgh, Scotland. She and her two older siblings were raised by their parents, William and Rachel Hay, in Edinburgh, although she used to spend her weekends at the family-owned Melville Castle on the outskirts of Edinburgh. Growing up, Linton attended St. George’s School for Girls before proceeding to Fettes College. Her penchant for acting soon led her to pursue a B.A in acting from Pepperdine University. According to her interviews, Linton remembers her interest in acting soaring after watching students from Pepperdine University participate at the Edinburgh Festival. So, as a young girl, she began professional training as an actress at The Edinburgh Drama Academy. Additionally, Linton trained with a private coach from the London Academy of Music and Dramatic Art, from which she acquired a certificate with honors. Louise Linton enjoyed a blossoming relationship with her parents, especially her mum; until tragedy struck when she was just 14. Linton’s mother, aged 53 at the time, succumbed to breast cancer. That experience will be the start of many things for young Louise. In 1999, she spent her one-year-after-high-school period serving as a volunteer in northern Zambia. Following her time there, she returned to Pepperdine University to pursue a B.A in Journalism. She also earned a J.D. degree from the University of West Los Angeles School of Law; a private, for-profit law school, accredited by the State Bar of California Committee of Bar Examiners. Louise Linton’s acting career went full swing when she landed her first role as a guest star in CSI: NY (2003). In the months that followed, she began to feature in other small roles in various indie movies. She was cast for a small role in the United Artists film, Lions for Lambs (2007), where she starred alongside Tom Cruise and Meryl Streep. In 2008, she played the supporting role of Katie in the horror film, The Echo. Delving into comedy, Louise Linton joined the cast of indie comedy Screwball playing comedic news reporter, Shannon Storm. She then played the title role in the romantic comedy, Serial Dater’s Anonymous (2017) opposite Sam Page which was shot in Milwaukee, where she played the role of a 1940’s Women Air Force Service Pilot. In the same year, Louise filmed a small role in The Midnight Man (2017) in Winnipeg. A film in which she was also Executive Producer. It would be her fourth collaboration with movie director, Travis Zariwny. In 2016, Linton became the subject of major backlash after her self-published memoir, In Congo’s Shadow, went public. The book centered on her experiences in Zambia. The Zambian High Commission in London and others criticized the book for its “inaccuracies” and promotion of the false narrative of “the white savior.” Linton later withdrew the book from sale and apologized for sparking the offense, promising to donate all profits from the book to charity. In February of 2017, Linton succeeded her husband, Steven Mnuchin, as the interim CEO of Dune Entertainment when he stepped down as part of his ethics agreement to disengage from his business roles in preparation for his appointment as Secretary of the Treasury. A role she relinquished later in May that year. Louise Linton currently serves as Ambassador for Mutt Match Animal Rescue in Los Angeles. Asides that, she is a global Ambassador for Protecting African Lions (PAL), an organization based in South Africa. Linton is also supporting Ol’ Jogi and the David Sheldrick Wildlife Trust, both Kenya based anti-poaching and animal rehabilitation organizations. Linton has appeared on several magazines like I-On, The Herald, Seven Days, Core, Your Life, and the Scottish Woman Magazine. According to Forbes, Linton’s husband, Mnuchin, has a net worth estimated at over $500 million. But long before meeting her husband, Linton has had a long history with luxury and wealth. Growing up, her family were what one would call “the affluent.” So it comes as no surprise when she wore an outfit worth about $5,000 on her return from a vacation with her husband and of course being nominated for a Scottish Style Award in far back 2009 is a louder statement. A 2018 estimate puts Louise Linton’s net worth at $2.5 million. For a woman her age, Louise Linton sure has an appealing figure and build. She stands at a height of 5 feet 7 inches (1.7 meters) and weighs 120 pounds (54.5 Kg). Her Breasts-Waist-Hips sizes measure 34-23.5-34 inches (86-60-86 cm). She wears dress and bra sizes of 4 (US) and 34B respectively. Linton has dark brown eyes and blonde hair.